In the Meiji period (1868-1912), Japan ended centuries of isolation and entered a period of rapid modernization after opening its doors to the world. The ensuing social and technological changes inspired a number of interesting urban legends. 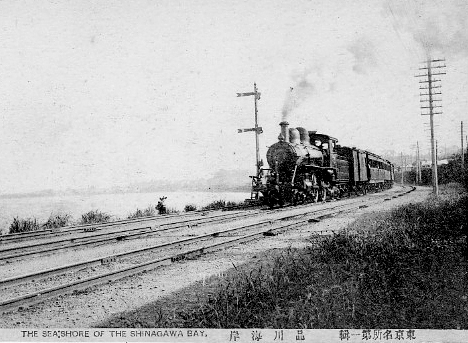 Railroads played a key role in the modernization of Japan. After the first trains started running in 1872, railroads quickly expanded across the country. But as the number of trains increased, so did the frequency of phantom train sightings. Most often seen by train conductors working late at night, these phantom trains -- which looked and sounded like ordinary trains -- tended to emerge suddenly from the darkness ahead. Shocked by the sight of an oncoming locomotive, conductors typically reacted by grinding their train to halt. Phantom trains usually vanished just before a collision occurred. These phantom trains, whose sightings have been documented by scholars such as ethnologist Kunio Yanagita and folklorist Kizen Sasaki, were often thought to be the work of shape-shifting animals such as the kitsune (fox), tanuki (raccoon dog) and mujina (badger), because the carcasses of these animals would often be found near where sightings took place. According to one old Tokyo tale, a phantom train used to appear frequently on the Jōban line. One night, while passing through Tokyo's Katsushika ward, a conductor spotted the notorious phantom train barreling toward him. Convinced it was nothing more than an illusion, he kept charging ahead without applying the brakes. At the moment of impact, there was a loud shriek as the phantom train disappeared into thin air. The next morning, a number of mangled badger carcasses were found scattered near the tracks where the sighting occurred. The nearby residents surmised that the badgers had banded together and shape-shifted into a menacing-looking train in revenge for being displaced from their homes. 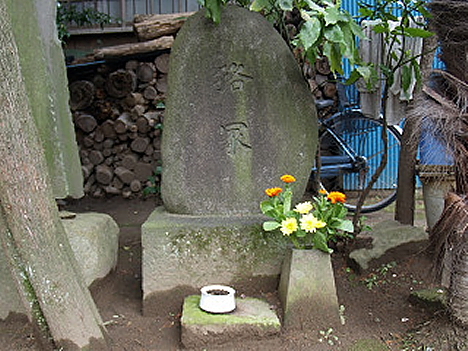 A burial mound was constructed for the badgers at Kenshōji temple in Kameari. A stone monument marking the spot of the badger burial mound can still be seen at the temple today. Like the railroads, electricity played a vital role in the modernization of Japan during the Meiji period. The spread of electricity brought overhead power lines to cities and towns across the country. These new additions to the landscape were regarded with suspicion by many, and they became the subject of various rumors. Coal tar was used as insulation for electric wires in the early days. Somehow, rumors began to circulate that the thick dark insulating substance was derived from the blood of innocent young women. At the height of the rumors, many virgins were afraid to go outside, fearing they would have their blood stolen for use on the wires. 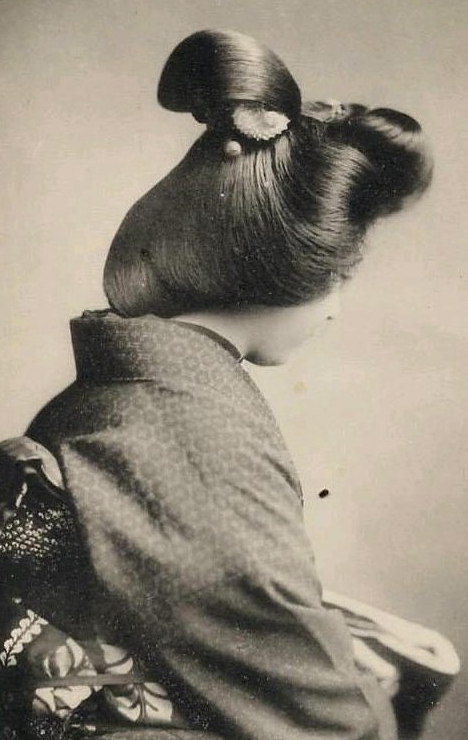 Those who were courageous enough to venture outdoors would sometimes disguise themselves as older, married women by wearing simple kimonos, blackening their teeth, painting their eyebrows, and doing their hair in the marumage style (rounded knot on top of the head). In addition to instilling fear in young women, power lines were also thought to transmit the dreaded cholera, which claimed hundreds of thousands of lives in Japan during the Meiji period. According to the word on the street, a person could contract cholera simply by walking under overhead power lines. If circumstances forced you to pass beneath a power line, you could protect yourself by holding an open folding fan over your head. The Meiji period also saw the birth of the chocolate industry. Although Japan's first taste of chocolate came in the 18th century via Dutch traders at Nagasaki, it was not until 1878 that Fugetsudo, a sweets manufacturer, produced the first Japanese chocolate. The novel taste was a hit, and other manufacturers quickly followed suit. Despite the early success, however, the exotic sweet had its doubters. Sales suffered a setback at the end of the century after rumors circulated that chocolate was made from coagulated cow blood. In 1877, in the aftermath of the Satsuma Rebellion -- an armed revolt of ex-samurai against the Meiji government -- a rumor spread that fallen samurai leader Takamori Saigō could be seen in the night sky. In September of that year, Earth reached its closest point to Mars (about 56 million kilometers), causing it to shine big and bright at night. Not realizing the strange red light was Mars, many regarded the star as an ill omen for Saigō's enemies. 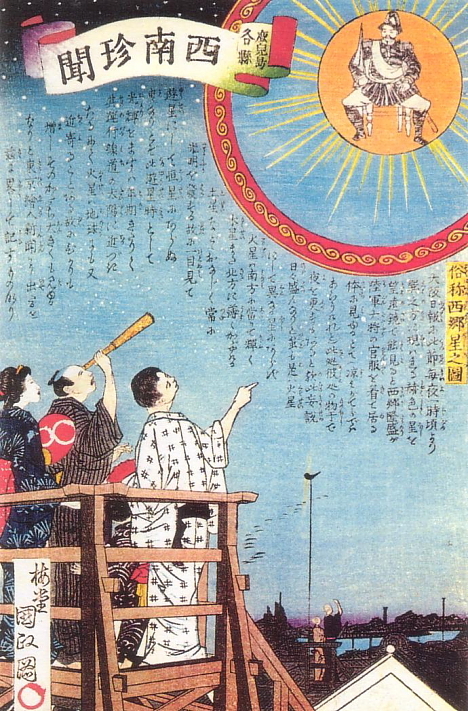 Rumors claimed that Saigō could be seen in full military dress in the star when viewed through a telescope. Woodblock prints depicting the so-called Saigō star were popular at the time. I love these, they are so interesting! More more more! Love your Urban Legends series, btw -- as well as the various myth / legend / occult / things that go bump in the night material. I guess those are badgers (Meles anakuma) and not tanuki (Nyctereutes procyonoides). Love this series. A Tanuki testicle train is hilarious. Uh, the story doesn't make any sense if it's not tanuki. And yes, it sounds like that particular incident, in addition to tanuki legends in general, was probably influencing the storyline in "Pom Poko." Actually the story makes perfect sense. Check the kanji on the stone monument. It says 狢, not 狸. The tanuki is not the only animal with shapeshifting skills. Thanks, mujina -- I could not for the life of me make out the kanji on that stone, but neither looked like "tanuki", yet the story so perfectly matches the "style" of the tanuki, not to mention the film ... And that's why I asked. So that guy in the star, is that the guy in the TOm Cruise movie? Why would Saigo come back. He was a war-mongering traitor and got what he deserved. As for the chocolate made of blood, there's a certain truth to that. I once ate chocolate crinkles that tasted like blood. It was normal on the first bite but when I savored it, I could clearly taste iron. I wasn't wearing any braces and I even checked my mouth if it had a wound somewhere. I had a friend with me that time who didn't believe me even though she also ate one so I was really upset that I couldn't enjoy my snack. There may be other factors that I probably haven't considered that time and meiji's bloody chocolate reminded me of that incident.